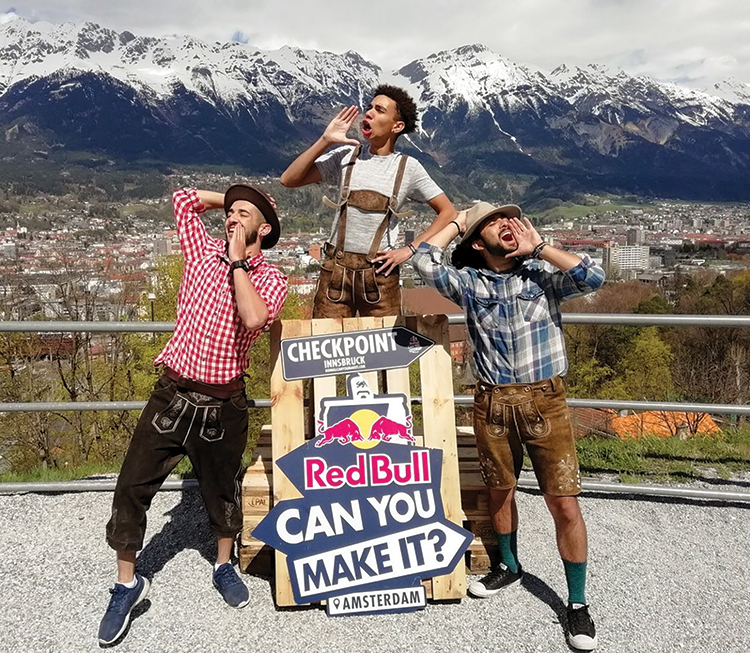 Three NMSU seniors participated in an adventure of a lifetime during the Red Bull “Can You Make It?” competition in April 2018. Team Naray, consisting of Emilio Baca of Belen, Torbyn Nare of Albuquerque and Jonah Kennon of Roswell, traveled from Budapest, Hungary, to Amsterdam, Netherlands, in one week. The trick of the adventure? You have no money or credit cards. To get from one place to another, Team Naray had to ask strangers for help by offering them cans of Red Bull energy drink in return. As Team Naray traveled through Hungary, Croatia, Slovenia, Austria, Germany and the Netherlands, the Sigma Chi fraternity brothers discovered people under the age of 30 were more willing to help them earn points by completing challenges and reaching Amsterdam in seven days. The team traveled 1,171 miles and used 140 cans of Red Bull energy drink to accumulate enough points and finished 28th overall.